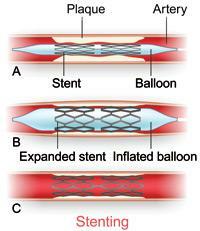 Intracoronary stents are small wire mesh tubes devices inserted into diseased blood vessels to expand the vessel and restore bloodflow. These devices, are typically inserted via a balloon catheter during a percutaneous coronary intervention (PCI). Drug-eluting stents have a polymer coating over the mesh that emits a drug over time to help keep the blockage from recurring.